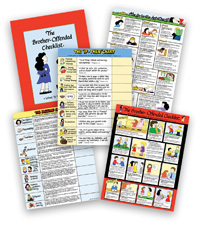 This discounted package gives you four Bible-based charts to help with character building, discipline, and sibling relationships in your home, our bestselling topical Bible for parents, and a quick-reference "checklist for parents" booklet. 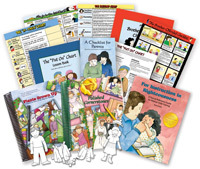 If you're new to Doorposts, and you want try our parenting materials, the books and charts in this package are the best ones to start with. The Go-to-the-Ant Chart - What the Bible says about diligence and laziness. 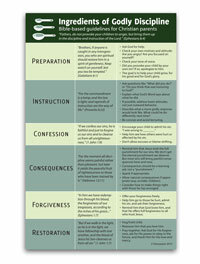 The Brother-Offended Checklist - Teach your children to resolve disagreements in a godly manner (study book included). This package comes with either small charts (8.5"x11," full-color, laminated), or large charts (16"x22," three in full color, one B&W). The small charts are more durable, and fit more easily on your walls, on the fridge, or in a notebook. The larger charts can be better for young children and early readers. For a larger package containing Plants Grown Up, Polished Cornerstones, and the Put On Chart, see the Character Training Package. I have been searching for these tools for the past 3 years! I grew up in a home where my mother believed Bible based parenting was the way to go. I loved my childhood and knew Jesus from a young age. One thing I remember clearly from my childhood is that the Bible has every answer! I remember my mom saying “Go to the Ant Chart...” She used these very tools in our home. I now have two children of my own and have been looking for the Ant Chart because I know how valuable a tool it is! I look forward to making my purchase of the whole kit and watching God work in my family through his truths that are laid out so nicely on the chart! As we strive to disciple our children we have longed to have more Scripture verses on hand and in our memory banks to show them why we are saying the things that we say. In this amazing set, all the verses have been organized for you according to subject. Although it does take time to familiarize yourself with all the information, it is such a blessing to have. It is amazing that the author was so devoted to parenting with the "Wisdom From Above", that they not only found all of this, but put it into book form, to make it easier for everybody else who desires to use it. It makes the Bible come alive when parenting to utilize not only verses about our children's behavior, but also to have the consequences from stories in scripture, ideas on how to turn those consequences into ones we can use now, and also the character quality that is the opposite of the offense. Oh I hope this made sense! If you pick it up, you will not be disappointed!!! Most helpful and simple parenting tool. Have used regularly for years. Really appreciate the if- then and blessings charts! Have recommended these to many parents and given as baby gifts. Wonderful and Biblically Sound Resource! Simple and easy to use! It is a great resource that every parent should have! I only wish it was in a different translation. Sometimes it is difficult to communicate the passages with little learners. The pictures and summaries make up for it though. My four sons range in ages 24-18. They are a testament of the goodness of the Lord when His Word is applied during the formative years. I am so grateful to have had these Doorposts materials while they were growing up. The boys weren't the only ones who benefited though - the Lord used these products to build character in me while learning how to parent them! Because of these materials and Plants Grown Up, I had answers at my fingertips for daily living. I cannot recommend them highly enough. I now purchase these kits to give as gifts for those I love who are expecting children. I have purchased this package (black and white as well as the color charts (x2)) on a homeschool website and became hooked! I love having Scripture readily available as I try to train and discipline my children. That was always a problem for me. I never knew what to address, and even when I did, Scripture was never involved because I never knew where to look. So, when I happened upon Doorposts, it was an answer to prayer. I needed a starting point and some accountability checkpoints when trying to use the Bible to raise my children properly. There is always a scripture associated with a character trait or transgression, which points them to God and not to worldly legalism. Using "What does God say about..." instead of "Do what I say because...", is the better approach. They don't need to be able to read because they can understand the pictures. My only real problem is that most of the verses are in the KJV, so I sometimes have to reread the verse in the translation we use. One other concern is that this is A LOT of information! I felt overwhelmed at first and didn't know where to begin. The Righteousness book is HUGE! I have finally come to understand that parenting takes a lot of preparation and studying on my behalf and being proactive rather than reactive. You should really study your Bible and the charts so that when certain things occur, you are ready to deal with it immediately. 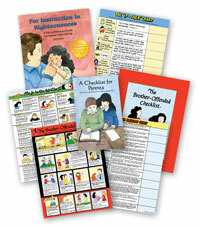 Even better, choose 1 or 2 topics a day to discuss with your children so they know what to expect. I took it for granted that my kids knew the right thing to do instinctively, when in fact, the opposite is true. They have to be taught and trained diligently in the ways of the Lord and if we are ignorant, then we are neglecting our responsibilities as parents and exposing our children to harm. Thank you Doorposts for making it "easier" (haha! If such a thing exists!) to parent Biblically.